In 1966, Ford Motor Company achieved what many in the motorsport world thought impossible, entering and winning the famous 24 Hours of Le Mans endurance road race in France with the GT40 Mk II. More than that, Ford left Ferrari utterly humiliated by sweeping the podium, taking first, second, and third place at the event. And then, fifty years later to the day, the Ford GT40’s modern descendant won the 24 Hours of Le Mans again, with cars placing first and third in the GTE Pro class at the 83rd running of the historic race. Ford’s World HQ in 1967, after a second consecutive Le Mans victory. Ford just recently announced a two-year extension of its GT racing program, meaning that the new supercar will be running in competitive motorsport at least until 2019. In other words, the automaker has the chance to light up its office in honor of Le Mans another three times over the coming years. 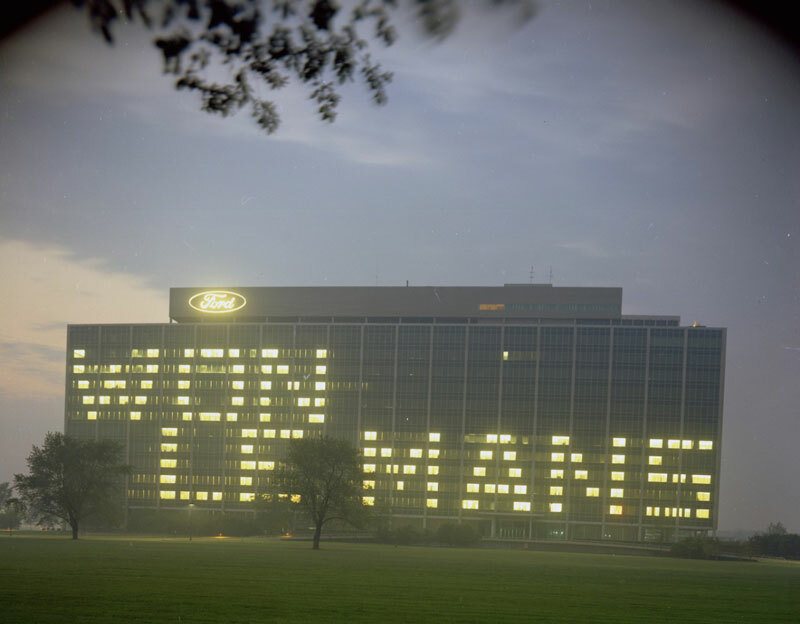 Ford’s World HQ this year, following its Le Mans victory on the 50th anniversary of the first.